Convey your thanks to champion groomsmen with this elegant executive golf set. 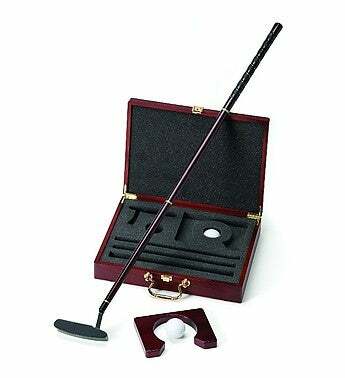 Lustrous wood case, augmented with brass handle, features an engraved brass plate that scores a hole in one. Includes a putter that disassembles for easy storage, two balls and a wood practice cup. Fore! Box size: 12 3/4" x 10 3/4"